It means Holy Thursday and it commemorates the final meal of fellowship that Christ had with His disciples...the Last Supper. 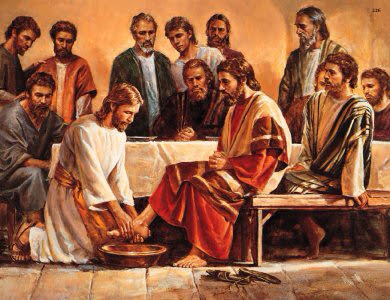 Jesus would wash the feet of those closest to Him and they would break the bread and drink the cup. It would be a time of intimacy and securing a deep relational attachment that we would still talk about many years later. When I think of the Last Supper I think about family meals today. In this culture we have today, time with the family around the table is harder and harder to facilitate. Our schedules are so busy, our stress level so high that we often grab what we can, when we can and we miss these special moments. When was the last time you got everyone together and sat around the same table to break bread together? It was important to Jesus because He knew how connections work and that eating together breeds "community". You may do this everyday and if so, keep at it. Don't let those moments be stolen away. For some of you it may be a struggle to get all the kids around the table again and just have some great food and conversation. But if you work at it, you can make it happen. I encourage you today to fight for those times! And when you have the family together, why not have a family communion service...just like Jesus did. Remember what He has done for you and your children. Family communion and personal communion can and should be practiced regularly. You and I can experience that same intimacy and long lasting bond with our friends and our families by keeping the communion experience fresh in our lives.